The ESI 40 IP Business Phone from Action CTI provides the powerful advantage of “one-wire” VoIP telephony. Works both locally (LAN) and remotely (WAN or Internet), and uses either Power over Ethernet or regular AC power, to maximize your connection convenience. 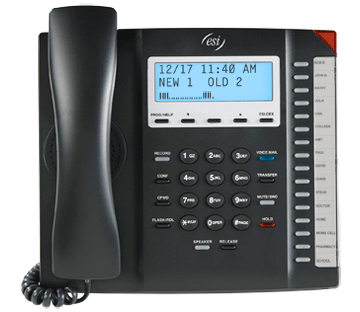 The ESI 40 IP Business Phone from Action CTI provides a full feature set to users who may not need all the “bells and whistles” of higher-level models yet do require access to all ESI system features. The ESI 40IP has a sealed membrane below the keys to make it virtually spill-proof; and the sturdy multi-position angled base lets it fit on any desk or counter space so you can easily see the status of the display and keys. The ESI 40IP model also can be wall-mounted. It includes an adjustable backlit display and a speakerphone. Programmable keys: 16 [up to 136 with optional Expansion Consoles attached]. Displays: Three-line, 56-character, with adjustable backlighting. The ESI 40D (digital) Business Phone is no longer available. 1. Availability of IP capabilities determined by system configuration. 2. IP-enabled legacy ESI systems use different IP desktop phones for local and remote applications. 3. Second Expansion Console supported by only IP Server 900, ESI Communications Servers, and [legacy] IVX X-Class.